This is a circuit of the walking paths on North Head including the Quarantine station. The leader is also surprised by the distance but his legs said about 15 and the phone confirmed it! Map: Manly lagoon to North Head. We made a beeline (if an errant bee) for a long morning tea at the Quarantine Station cafe. Getting our priorities right from the start. Then an exploration of this sprawling site and a peer in the window of the first class dining room. 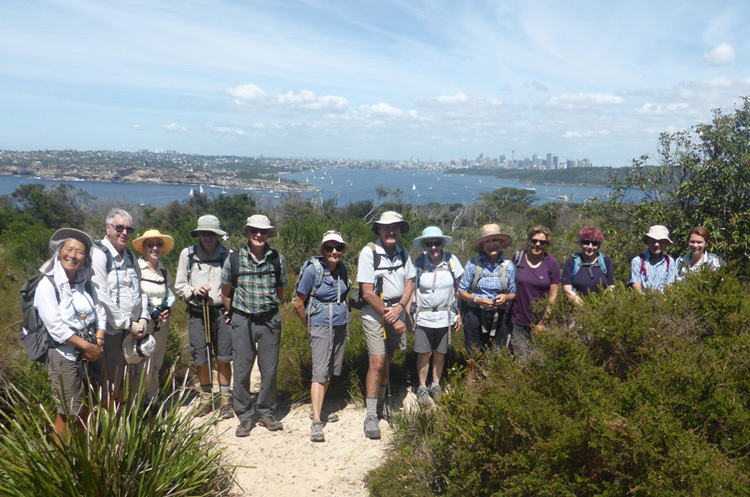 After a BUSH WALK (we were in dense heathland for much of the day) we found shade for lunch which was interrupted by the appearance of a large group of Ramblers looking good for their age (the club's 90th birthday is next month). After a walk through the grounds of St Patricks Estate we talked our way in for a look at the inside of this magnificent gothic revival structure. The sartorially elegant greeter explained that St Patricks is fully owned by the Catholic Church - just leased to the International College of Management. We were told that Tony Abbott had attended - we had seen the man himself before a bank of cameras at Manly. Then we dallied inside the glorious Chapel with the sounds of the bush replaced by a superb single female voice A Cappella style filling the huge space with its soaring ceilings.